While the number of Democratic candidates remains well below the number squeezed into the Republican clown car, the number is growing to the point where very soon they will no longer all fit under Donald Trump’s hair. Jim Webb has officially announced and there is increased speculation that Joe Biden plans to run. Most of the Democratic candidates are challenging Clinton from the left. After all, there is not much room to the right of Clinton short of being a Republican. Perhaps a former Republican such as Webb can find a niche as former Republican Lincoln Chafee is running to the left of former Republican Hillary Clinton. It actually isn’t so simple as to say Webb is running to the right of Clinton as he, along with every other declared candidate, is attacking Clinton’s support of the Iraq war, and her continued support of increased military intervention as Secretary of State in Libya. Let me assure you, as President I would not have urged an invasion of Iraq, nor as a Senator would I have voted to authorize it. I warned in writing five months before that invasion that we do not belong as an occupying power in that part of the world, and that this invasion would be a strategic blunder of historic proportions, empowering Iran and in the long run China, unleashing sectarian violence inside Iraq and turning our troops into terrorist targets. I would not have been the President who used military force in Libya during the Arab Spring. I warned repeatedly that this use of our military did not meet the test of a grave national security interest, that it would have negative implications for the entire region, and that no such action should take place without the approval of the Congress. It is still hard to see a Webb have much of an impact in this race. If he ever had a chance, he probably ended it by being the only candidate to defend the use of the Confederate flag. “It was almost a diametrically opposed reaction than to Hillary. With Hillary, no excitement, they couldn’t get enthusiastic about her for whatever reason,” said Mr. Cooper. “But when I mentioned that maybe Biden was going to enter the race, there was palpable excitement. “They are champing at the bit to raise money for Biden,” he said. Of course Clinton has been doing a fine job of raising money despite this lack of enthusiasm, but that could change if she loses her position of looking like the most likely to win the nomination. The rapid rise in support for Bernie Sanders demonstrates the desire for a more liberal alternative to Clinton, and her current scandals make it far too risky for a major political party to hand Clinton the nomination. Even if she didn’t have these major negatives, she has shown that she is not up to a political campaign. Jennifer Rubin gave ten reasons in favor of Biden running against Clinton. I don’t think I have ever agreed with Rubin on so many points before. In a lot of ways, Biden would be the true anti-Hillary. He is completely uninhibited, he is impossible to script — which makes him seem authentic — and he has a human appeal that everyone can relate to. Clinton, on the other hand, is running a surreal campaign that avoids crowds, media and spontaneity of any kind. She is protecting her lead in the most standard, unimaginative way possible. Compared with Clinton’s robotic, stiff approach, could having a reputation for occasionally saying the wrong thing and hugging too much work to Biden’s advantage in an era where voters want the real thing? The Democrats appear to be yearning for an emotional connection with their candidate, which could explain the flurry of excitement surrounding the Bernie Sanders campaign. Sen. Sanders seems to have an outsize appeal, which could be a product of how his outside-the-box approach contrasts with the stale Clinton march. 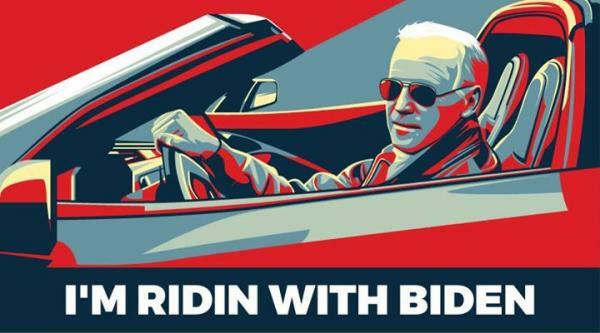 But whatever Bernie can do, can’t Biden do it better? Maybe Sanders’s candidacy has exposed the opening that exists for Biden in the Democratic primary. Maybe this is Biden’s moment. Hillary Clinton enjoys a 19-point lead among likely Democratic caucus-goers in the key state of Iowa over her nearest challenger, Vermont Senator Bernie Sanders, but that advantage has shrunk 26 points since May, according to a Quinnipiac University poll released Thursday. The former secretary of state gets the support of 52 percent of her party’s likely caucus-goers in the state, which holds the nation’s first nominating contest, while Sanders, a Senate independent and self-described socialist seeking the Democratic nomination, pulls in support from 33 percent. In May, the split was 60 percent to 15 percent. It is the first time Clinton has received less than 60 percent support in the poll, according to assistant poll director Peter A. Brown. While Clinton still has the lead for the nomination, there are still several months for Sanders to make up this deficit. Typically the Iowa polls remain quite volatile with many caucus voters not deciding until the last minute. National polls for the nomination are virtually meaningless at this point as candidates who do well in Iowa and New Hampshire typically show a major bounce after victories in the first two contests. Democratic presidential candidate Sen. Bernie Sanders (I-Vt.) drew 10,000 supporters, the largest crowd of his campaign thus far, according to reports. 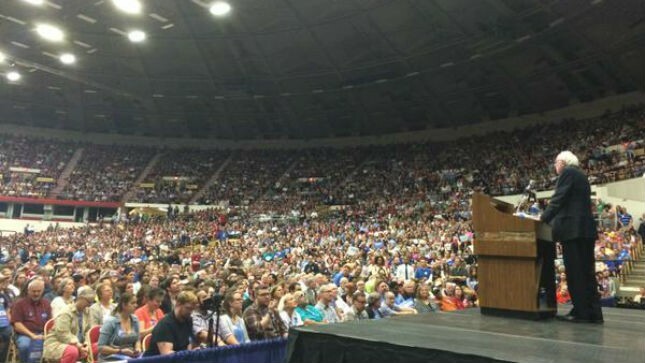 “Tonight, we have more people at any meeting for a candidate of president of the United States than any other candidate,” Sanders told his fans at Veterans Memorial Coliseum in Madison, Wis., according to The Associated Press. Democratic gains in party affiliation may be partly linked to more positive views of President Barack Obama, whose job approval ratings were near his personal lows last fall but have recovered, perhaps related to low unemployment, lower gas prices than a year ago and an easing of some of the international challenges that faced the U.S., such as the Ukraine-Russia situation.